 Government of India, Ministry of Home Affairs, Disaster Management Division, National Emergency Response Centre (NERC), “Situation report on Heavy Rain fall in Kerala, Karnataka, Assam, West Bengal and Uttar Pradesh,” August 26, 2018, https://mha.gov.in/sites/default/files/Situationreport26_27082018.pdf. Amit Badhuri, “Kerala battles the worst flood since 1924,” India Water Portal, August 25, 2018, http://www.indiawaterportal.org/articles/kerala-battles-worst-flood-1924. T.K. 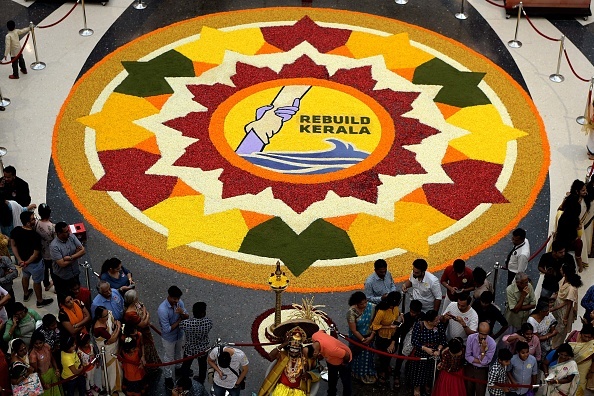 Devasia, “Kerala, After the Flood: Displaced migrant workers heading home will adversely affect rehabilitation efforts,” FirstPost, August 21, 2018, https://www.firstpost.com/india/kerala-after-the-flood-displaced-migrant-workers-heading-home-will-adversely-affect-rehabilitation-efforts-in-the-state-5013551.html. “Kerala floods: Will hold a discussion with Centre on UAE relief aid issue if need arises, says CM Vijayan,” The Indian Express, September 4, 2018, https://indianexpress.com/article/india/kerala-floods-rains-rescue-bakrid-eid-relief-assistance-pinarayi-vijayan-5318473/. Prabhash K. Dutta, “Beyond floods: How much money Kerala receives from UAE,” India Today, August 24, 2018, https://www.indiatoday.in/india/story/kerala-uae-remittances-1322340-2018-08-24.